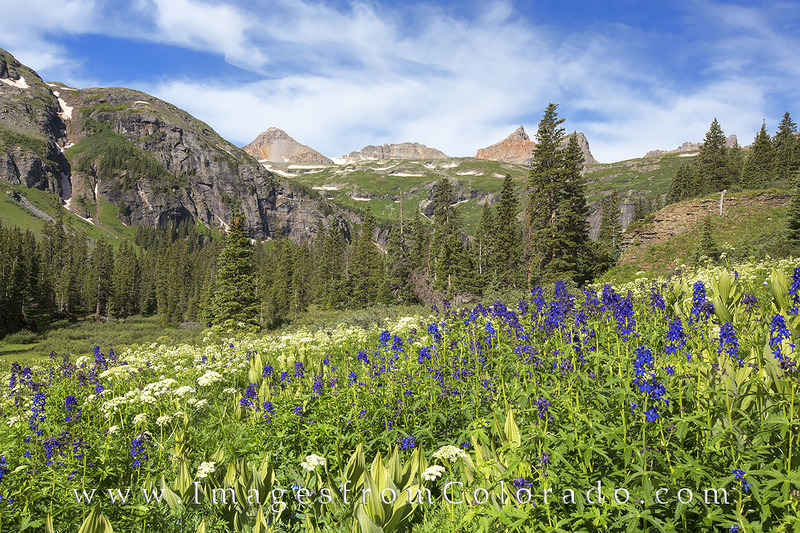 Lupine fill the meadows in the Ice Lakes Trail basin. In the distance, four 13,000’ peaks rise into the cool morning air, including Fuller Peak (13,761-ft.), Vermillion Peak (13,894-ft.), Golden Horn (13,780-ft.) and Pilot Knob (13,738-ft.). The trailhead starts near Silverton, Colorado, and leads you through this area, past Lower and Upper Ice Lake and onto spectacular Island Lake. The hike is a little over 8 miles round trip and climbs about 3,000’. The grunt-work is well worth it, as the views at Island Lake are beautiful. Photo © copyright by Rob Greebon.